Here at Smart Finish, we get to see/repair/drive all sorts of vehicles. Old or new, cheap or expensive, utility or luxury. 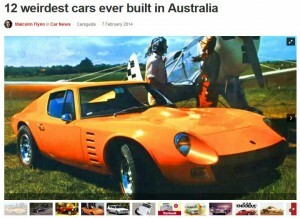 We think it’s fairly safe to say, however, that we haven’t yet repaired any of these Aussie-built cars! Check out this article for a brief history lesson. With all the recent news about local car manufacturing, you could be forgiven for thinking Australia has only ever built Fords, Holdens and Toyotas. But in fact, we’ve got a long, varied – and often quite weird – car building history. Perhaps the most surprising car in the list is the “Goggomobile”, which – thanks to this old YellowPages advert – you might have always believed was a Scottish import. Not so according the article above!